This page is dedicated to our Herping Maryland series. Here you will find videos of our adventures through all the different geographic regions of Maryland. From the mountainous terrain of western Maryland, across the jagged peaks and stream beds of the ridge and valley region, the fertile Piedmont, and the eastern and western coastal plains, our crew will herp it all. They will uncover not only commonly recognized amphibians and reptiles in their searches, but many of the lesser know creatures that inhabit these areas as well. This series is a work in progress. The videos presented below are in no way the sum total of this series, there is much more on the way! Be sure to check back frequently, then click here and give us a like on our facebook page so you'll know when new videos are uploaded !!! The first installment of what is an incredible journey that will expose many of you to the lesser know creatures that inhabit our environment. Michael, Chris, and Matt are at the helm producing this series. They spend much of their spare time in the field herping, and with their expertise, and cameras in tow, they not only provide spectacular footage of the reptiles and amphibians that call Maryland their home, but also offer tips and tactics on how you can make your own herping trips more productive as well. In this episode, they made a mad dash in the early spring for Maryland's eastern shore, between late season snowstorms, to catch the spring amphibian migrations. Some of the woodland denizens they encounter can only be found out and about this time of year on their trek to the vernal pools in which they breed. They then disappear underground for the rest of the year. You wont want to miss this. Be sure to join them! 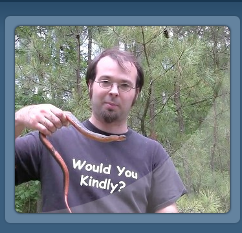 Maryland's Piedmont region is the target of the second video in our Herping Maryland series. After a long cold winter, the reptiles and amphibians can be slow to get moving. With a little local knowledge of the creatures that inhabit the area, Michael and Matt head to a location known to be a favorite den for snakes over the winter. This saved them much leg work. The reptiles are still hanging out close to their den catching the first warm rays of spring sunshine, and they uncover numerous species of snakes in a relatively small area of the forest! 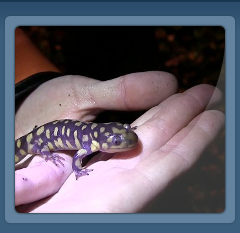 In episode three of our herping Maryland series, Michael does some early spring herping around a small pond on Maryland's eastern shore, after dark. He explains why this is a very good way to make numerous finds, and offers some tips that could help you do the same. The aquatic theme continues as he joins Matt on the eastern shore and they catch the relatively obscure red bellied water snake. A small specimen is grabbed, then a real beast is caught by hand. This is just the beginning of the footage from Maryland's eastern, and western coastal plains! There will be more episodes, and great finds, from these regions as summer progresses ! In episode four of our Herping Maryland series, the summer weather heats up. Chris was up for a visit from Florida, and it's decided to head to the ridge and valley region of Maryland, not only because Chris wanted to find a wood turtle, but also because the climate is a bit cooler in the summer there. It didn't take long to make the first find, a northern copperhead snake. This snake was none too happy about having been uncovered, and repeatedly struck at any and everything he could. I was worried Matt had been bitten, but he had just caught his finger on the rock the snake had been underneath. After this encounter, it was down into the woods and creek to cool off. Good fortune was with us, and the wood turtle soon put in an appearance! In the fifth episode of our Herping Maryland series we visit Maryland's western coastal plain. Some very significant finds are made. The Eastern Hognose is among them, doing it's best to frighten off our avid herper's with it's amazing puffing and hissing threat display, all captured on video. Also found were the Mole Kingsnake, rather rare for Maryland, as this is the northern most extent for it's range. But the real trophy of this video is a jewel of a snake. 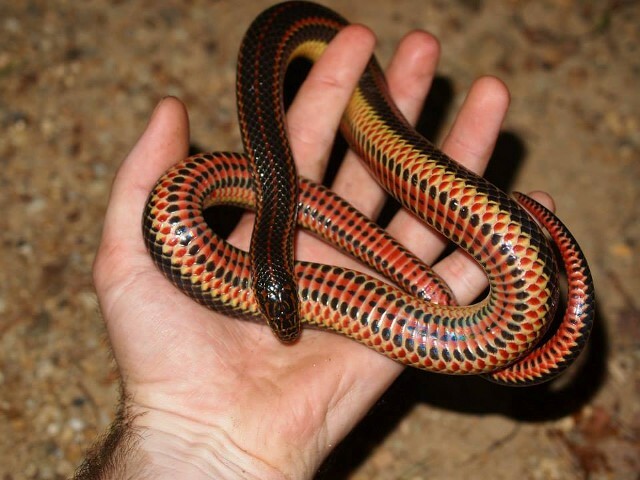 The Rainbow Snake, very reclusive and hard to find throughout it's habitat, and an increasingly rare species in our state, due to habitat loss and it's popularity with collectors. It's only found on the western coastal plain. Not much is known about this species, only a very few specimens have been located alive, most are found crossing roadways, and even fewer have been collected in their habitat in situ. This is one of the very few found in that fashion, and Matthew was the lucky herper to have done so. Waiting until later in the summer was our plan to shoot the video of our herping expedition to Maryland's Appalachian Plateau region. Located in the extreme western part of the State, the terrain is mountainous, and the climate much cooler than other areas. The summer heat takes longer to warm the land and create good herping conditions here. We timed things just right, and made some great finds, including a neonate (newborn) timber rattlesnake. If you watch closely, you can see it is still dragging it's umbilical cord behind it ! Maryland's ridge and valley region is the setting for this video. An early spring visit finds the elusive Jefferson Salamander above ground and migrating to the vernal pools for their annual breeding rituals. Summer slowly crept by, but as fall arrives the venomous snakes head for their winter den sites. A visit to one of these areas found numerous timber rattlers and copperhead snakes preparing for winter. Not only have they arrived to shelter from the cold, but they also gather in these areas to give live birth to their young. We managed to gather some fantastic footage of several clutches of neonate (newborn) timber rattlers, mother rattlers guarding their young, and gravid females preparing to give birth. 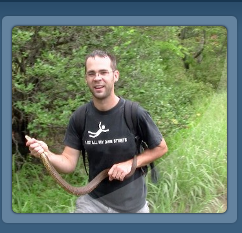 We also included some fantastic footage of a copperhead we discovered in the process of shedding it's old skin. A not to be missed adventure awaits! As with any other production or series, as we filmed Herping in Maryland, we did many takes. Sometimes things would run smoothly, and we would capture what we wanted to show, and say what we wanted to say on the first or second try. This is not often the case. Many times you stumble on words, forget to mention a unique fact about a creature you wanted to include, or neglect the close up shot. So you do it again. Needless to say this results in a lot of footage. Since we wanted to edit and post our series in a timely manner, we took the cleanest takes and featured those creatures. We then found there was a lot of footage left over. We also found that some of this footage was of reptiles and amphibians that are somewhat uncommon, or even endangered in Maryland, and we wanted to be sure to include them as part of this series. So we are releasing this video, appropriately titled "Bits and Pieces". We sure hope you enjoy it ! What series on herping any given State would be complete without including the State Reptile? Michael travels to Maryland's eastern shore to locate the Diamondback Terrapin and include it in our series! This unique aquatic turtle has become iconic in Maryland, not only because it is our State reptile, but also the mascot of the University of Maryland. The species is threatened by over-development, and the crabbing industry in our Chesapeake Bay, often drowning in crab traps. Michael touches on these issues before traveling across our State to the mountains to find another very rare species for our State only found there, the Green Salamander. We hope you are enjoying our herping adventures here in Maryland! 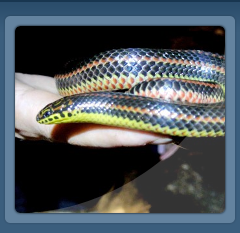 There are still many fascinating creatures we want to include in our Herping Maryland series. Many of these are the rarer species that prove somewhat difficult to locate. But we will be visiting the streams, fields, and swamps, putting forth every effort to locate them! Be sure to click here and give our facebook page a like and you'll receive notifications in your news feed when we release new videos in this series! If your looking for more herping action, please join our crew as they travel to other locations here, and all over the U.S.A. by clicking here for a complete herping play-list!